SoftComply Risk Manager is an add-on for Jira to manage, trace and report your software product risks. SoftComply Risk Manager is fully integrated to Atlassian Jira, with transparent pricing and full support from SoftComply. 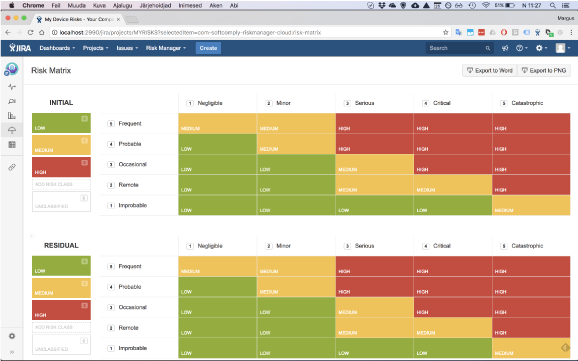 Automates your product risk management & visualizes your risks in Risk Matrices! Automated generation of Risk Reports that include your Risk Project settings in the Risk Management Plan and visualization of your risks in the Initial and Residual Risk Matrices for the Risk Management Report. Risk Reports are customizable. SoftComply Risk Manager is a Software Product Risk Analysis add-on that is fully customizable to any risk management method or approach you are using. SoftComply Risk Manager is the 1st product risk management add-on for JIRA Cloud & the only one for safety-critical industry! Get SoftComply Risk Manager from as low as $50 per month from Atlassian Marketplace. The majority of our clients are from the USA, the UK, and the rest of the Europe & they include startups as well as Fortune 500 companies. Trace your risks by linking them with mitigation actions, requirements, test and everything you need! Each risk can be linked to requirements, mitigation actions, verification actions and other risks! Want to learn more about SoftComply Risk Manager? Let’s have a call for a demo!